We are very excited to share some big news with you people! Spectrum, our colorful and abstract platformer is coming to consoles this august! Last time we gave you an update, we were working hard on bringing Spectrum to Nintendo Switch and gave you some insight regarding the brand new mode we created for this amazing console. 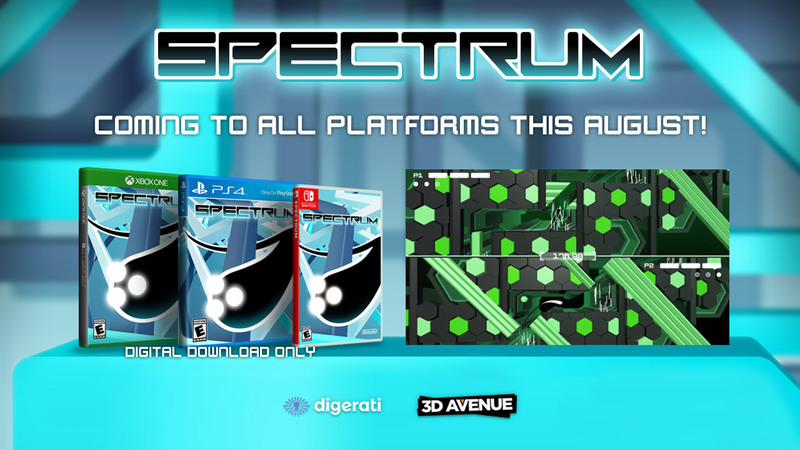 Since then, we focused on tweaking and improving the game to ensure everything was in order before the release, and now we can officially announce that Spectrum is heading to Nintendo Switch on August 20th! The game will feature over 70 challenging levels and all the improvements and updates we have made in the past, plus a local multiplayer mode exclusive to Nintendo Switch, meaning you will be able to race against your friends with a pair of joy-cons in an old fashioned split-screen way! As we initially announced, Spectrum will also be available on PlayStation 4 on August 21/22 (NA/EU respectively), and 24 August for Xbox One. The game will be available to pre-order from the Nintendo eShop starting 10 August. For Xbox One, pre-orders will begin 13 August in the Xbox Store. There will be a 20% discount on all pre-orders. For PS4, PS Plus subscribers will be entitled to a 20% launch discount, which will run until 5 September. Be sure to check back again for more news regarding our beloved platformer!